Chris Christensen: Amateur Traveler Episode 213. 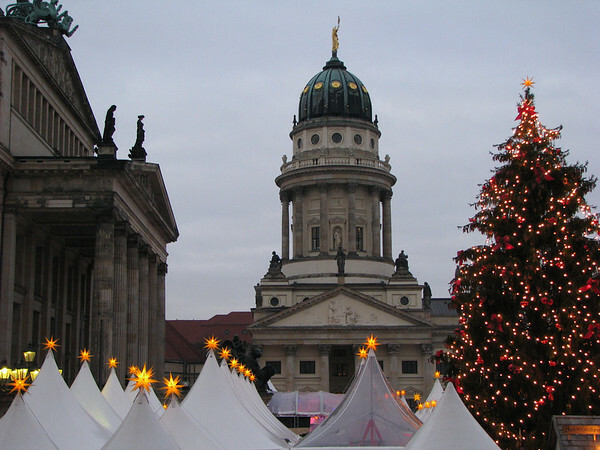 Today on the Amateur Traveler we will be talking about World War II, Gluehwein, and Christmas Markets as we go to Berlin and to Prague. Welcome to the Amateur Traveler. I’m your host, Chris Christensen. This show again like the last one will be a little different as there won’t be an interview guest. I’ll be talking about my latest trip to Berlin and to Prague. In the news there is a lot of bad news that happened. I’m starting this recording on Christmas morning and the kind of news that we had over the last week was a British Airline strike that almost happened stranding lots of passengers for Christmas. The chunnel train getting stuck in chunnel and people being stranded at train stations in Paris and London for a couple of days. Two different planes skidding off the runway, one in Jamaica because of rain and one in Glasgow which hit ice also skidded off the runway. The first, an American Airlines jet and the second one Orion Air Jet. So the biggest thing I would like to say at this point is I hope you were able to get safely wherever you were traveling to this holidays and that none of these new stories affected you or anyone that you love. At the end of this show, stay tuned and I have a special announcement about the first Amateur Traveler trip to Vietnam. But first let’s talk about Berlin and Prague. 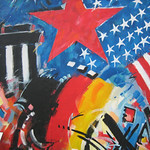 As I think I mentioned on a previous show, probably last week’s show, we were just in Europe in Berlin and Prague. We had gone to Geneva to pick up my daughter who is been studying there for a semester and had decided we wanted to do some vacation right after we did that. I probably would have preferred to go Europe earlier in the year but she needed to get there in August and really didn’t work for us to go at that time and also August is a time period that I really don’t like to be in Europe because everybody is on vacation and also because the weather is particularly hot in that time of year. So we just ended up with a December vacation instead. Knowing that it was going to be cold obviously at that time of year in Europe and we decided just to make it colder still that really the parts of Europe that I haven’t seen are more Eastern Europe. I hadn’t been to Berlin since shortly after the fall of the wall and this being the 20th anniversary of the fall of The Berlin Wall, that seemed like a real special place to go and then also Prague which of course we had heard so much about is some place that I have been longing to go for some time and so we flew from Geneva to Berlin and I’d have to say that that portion of our trip didn’t start all that auspiciously because we had booked an apartment through the internet and we were in a neighborhood in what used to be East Berlin kind of North of the City Center more of an immigrant neighborhood and I wasn’t particularly concerned about that. And I was supposed to meet the person who we had booked the apartment through and they were going to let us into the apartment. So we ended up hitting an internet café. One trick is if you are in a city these days especially in Europe and you’re looking for a low-cost internet café these kind of neighborhoods that are immigrant neighborhoods where there are a lot of people living, who are from another country are actually great place to find both an internet café as well as ways to call people through the internet. They often have computers with Skype setups and headsets and everything and so we just went across the street and got an internet café and quickly booked another hotel right off the Kurfurstendamm or right off the main street in what used to be West Berlin. And the thing we did the first full day there which we had heard about from friends of Beth, my daughter, who had been to Berlin was a free walking tour — there are walking tours that are targeted probably predominantly at the hostel set and if you go to a hostel you’ll see these advertisements for free walking tours of Berlin and they started the Brandenburg Gate and they had several of the major attractions. Ours was done by a guide named Leo and Leo is an animated Brit who is living currently in Berlin and they tell you right up front that the way that they make a living at this is they are going to ask you at the end for a tip. If you feel that they have earned one and I like that upfront approach. We knew up front that their normal tours were something like €12 for a couple hours and this was a three-hour tour that we could decide what to pay and we did end up paying something like €10 to the person and my impression from how he reacted to us handing him that is that most of the hostel crowd is paying less than that. They’re on a budget that’s probably tighter than we were running on and so that was well received by Leo, our guide but he did a great job. It really is something that I would recommend trying out whether you’re hosteling or whether you’re staying at a hotel as long as you’re willing to walk around for three hours and of course we were walking around for three hours in December and it was chilly in Berlin as I said. And then the second speech obviously that is well known is Ronald Reagan standing at the wall saying, “Mr. Gorbachev, tear down this wall. ” And so we stood there and heard some of the history of the monument as well as some of the history of the wall and then went over to the Reichstag or the German Parliament Building which is right near there and heard some of that history as well and that building having fulfilled a couple of major interesting historic roles of being the center of the German Republic during the short period of time that the republic existed before the Third Reich took over and then also being sort of the last major battle in the Battle for Berlin as the Soviets flew their flag over the Reichstag. It was left largely damaged by that particular encounter and now it has this wonderful clear dome above it where people can go up a ramp and look down at the laws being made in the country right now. The government having moved back to Berlin after the fall of the wall and after the reunification of East and West Germany. And as Leo, our guide put it now the lawmakers can look up and see their constituents or really not their constituents but tourists like us, but it is an interesting symbol and we did get a chance later on to go up in that and I would recommend it if you’re in Berlin. Although you don’t do it on this particular walking tour. From there we walked South along what used to be the wall between East and West Berlin and in one of those places that used to be The Death Strip or The No Man’s Land that used to be filled with landmines and watchtowers and such, they’ve now built a memorial to the Holocaust or to the victims of the Holocaust specifically the Jewish victims and the name of the memorial in very matter-of-fact German fashion is the Memorial to the Murdered Jews of Europe. It’s an interesting memorial, it is 2011 different stones of various heights and some leaning over on undulating piece of ground. It’s not necessarily supposed to represent anything specific, the number is not supposed to be all that significant but the artist did say that one of the things that they were thinking of or one of the things that they got inspiration from was the Jewish cemetery in Prague which we were to see later on our trip. Interesting memorial and definitely something I would say check out. And then not far from there we went to a fairly nondescript parking lot and the reason for that is that is the location of Hitler’s bunker. There is no memorial, there is no monument. There you just couldn’t figure out any appropriate way of pointing out that this is a historical site without looking like you are in some way celebrating it and so there’s nothing there at all and so we just stood there in the parking lot and talked about some of the last days of Hitler and the Third Reich. Near there, there is a very imposing, very Nazi Germany style architecture, large government building. 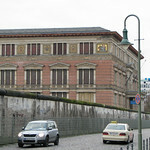 It was originally Luftwaffe Headquarters. It’s now the German Taxman so it’s still an imposing building. 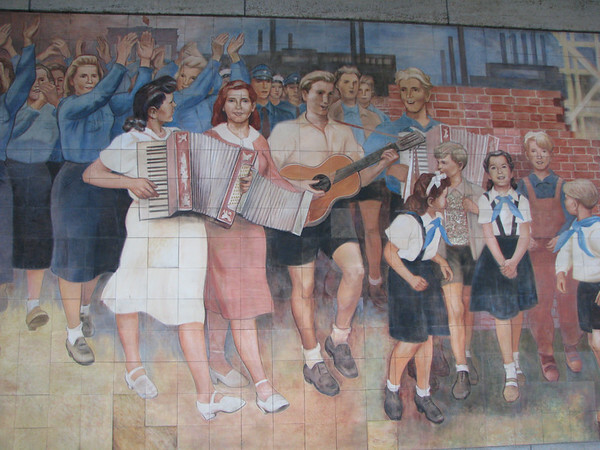 On one side of it there is an interesting mural, it’s a mural that was painted I believe it’s a 1952 by the communists in East Germany and it’s the happy life of communism and people dancing and singing him parading and everything is good and ironically directly in front of it there is a memorial to the East German Dead who died in the uprising in 1953 and so this is also one of the spots where the myth of what East Germany was really started to crumble and this was an uprising that was started because the communist government who was doing central planning raised the amount of work that needed to be done and lowered the amount of wages and the trade unions sort of protesting against that and it ended up with the Soviets sending in tanks. There is a lot of Cold War history as we were doing this trip to Berlin especially because of the wall falling 20 years ago. So we went from there for instance to see a section of the wall just on the other side of the building there is a not intact section of the wall, it’s been somewhat vandalized but there is a section that runs right next to that building that would’ve been the border between East and West Berlin and then from there to Checkpoint Charlie and Checkpoint Charlie is one of the well-known checkpoints between the Soviet sector and the American sector and later on one of the few gaps that in the wall where you could get through if you had the right papers. And while we were there we saw Trabant’s drive by, and I don’t know if you know the Trabant. When I was in Berlin 20 years ago just after the wall fell, the Trabant was still very common in East Germany. It was the East German manufactured car, it’s a really little car, kind of a clown car and it burned not just gasoline but also oil so it let off kind of a smokescreen as it went around at least the ones that I saw on the highway at the time and I was driving a Volkswagen Westfalia at that time. So I was in this big bus kind of thing. We drive by these little tiny Trabant’s. As soon as people could buy Western cars they largely were not a favorite but there is a company that does a Trabant tour or Trabi-Tour of Berlin and they went by in caravan with their little Trabi’s and with the sign on the side. 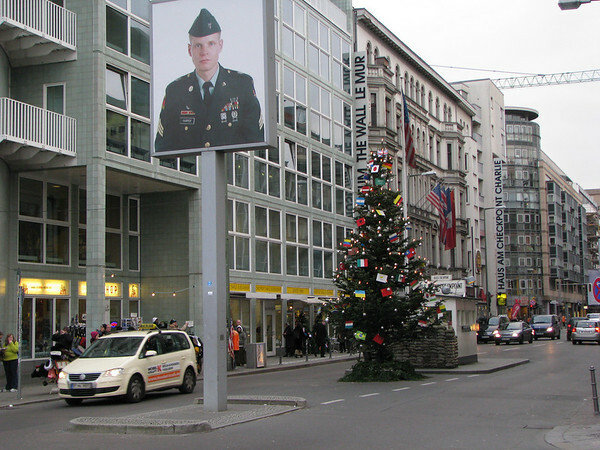 We got back to Checkpoint Charlie later on in our trip because there is a museum there and it’s simply called the Museum at Checkpoint Charlie and it was started within a year after the wall fell. The person who started the museum wanted to document some of what was going on with both the Cold War as well as The Berlin Wall, the history of it and the escapes and he started with a two bedroom apartment in the block of flats right there at the wall and now it basically takes much of that block and so we didn’t really realize how large it was. We spent about three hours there and it was fascinating. Now the museum could use some reorganization because it grew sort of organically and it doesn’t always make sense that you’re getting some information in this room and then again in another room and such. You could use some reorganization but there was just a lot of information there and displays in lots of different languages about the fact that those Soviets had continued to run concentration camps like Buchenwald, not as concentration camps but as relocation camps and tens of thousands of East Germans died just after the war who were shipped off to Buchenwald. They had records there of all the names of the dead and then they had pictures of all the escapes as well as some of the mechanisms like people who had put two suitcases together and cut a hole so you could put a person lying in both suitcases at one time and fool the guards, or hollowed out surfboards or cars with secret compartments or the people who flew an ultra-light into Berlin and out again and managed to pull off an escape or then they also had an exhibit to the family that escaped in a homemade balloon that they had made that was featured in the 1982 movie Night Crossing. I don’t know if you remember that movie, I think it had Beau Bridges in it. 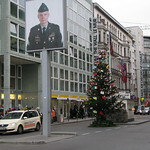 Anyway that’s Checkpoint Charlie, we went from there to the Gendarme Square and Gendarme Square has two matching churches and the reason it has two matching churches is at one point the French Huguenot’s who had fled to Germany asked the emperor to build a church there and he did and then the German said, “Well we would like one too. ” So he built facing it on the square and the German one apparently is a foot taller but other than that they look identical and of course in between them at this point in the year there was a Christmas market. There was a Christmas market just everywhere, every square we went to in Germany had a Christmas market. You couldn’t throw a shtolen as I say without hitting a Christmas market. And we went from there to the public square outside of the State Opera House. This was built by Frederick II in 1740 and he was a great patron of the arts and he was also a more open ruler and so there’s also the first catholic cathedral that was built after the protestant reformation in this protestant portion of Germany on the square, there is St. Hedwig’s cathedral and there is an old library on the square also and because of the old library there is a monument here for the books that were burned on May 10th, 1933 when they first started burning books under the Nazi regime under Goebbels. 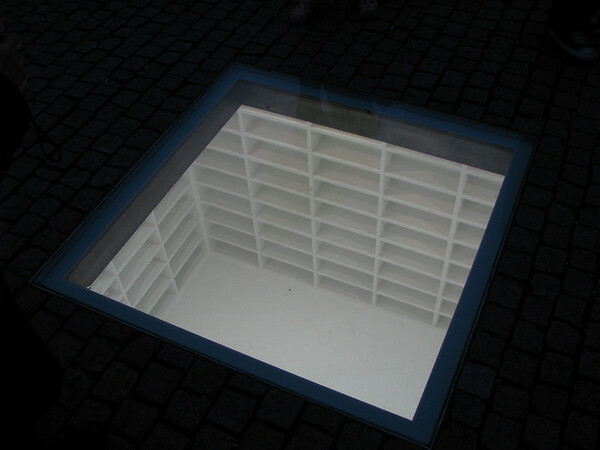 The organization wide book burning and burned 20,000 books by Jews, Communist, Pacifist and such in a fire in the middle of the square here and there’s an interesting glass memorial where you can look down and see lighted empty bookshelves that would hold about 20,000 books. And then finally the end of the walking tour this is all this three hour walking tour was on museum island in front of the Berlin Cathedral which is a very Rococo building. It’s very interesting different styles and such kind of over the top and on the steps of the cathedral Leo reenacted for us the miscommunications that happened in East Germany that led to the fall of The Berlin Wall were basically there was pressure already as other places in Eastern Europe on the other side of the iron curtain, both Czechoslovakia as well as Hungary had opened their borders and so people were fleeing West Germany through those countries out to the west and so they went to put in place travel restrictions that would allow people to travel if they had the right paperwork and such but one of the ministers who really wasn’t well briefed held a press conference and he said, “And we’re announcing that we can allow travel to Western. ” People said, “When?” And he couldn’t find anything on the paperwork they had given him that said when this was going to happen and the only date on the paper was today’s date and so he said, “Immediately. ” And 20,000 people within a few minutes are at the border and the guards don’t know what to do and so they end up letting the people through and it was entirely accidental it wasn’t the plan but it’s a fascinating history that caused the fall of The Berlin Wall, that was really the floodgates were opened at that point. So that’s again the walking tour, it is a free tour we did as I said, paid €10 per person and that seemed to be a little above average based on his reaction to that. But it was certainly worth it, very good tour and I would recommend that. 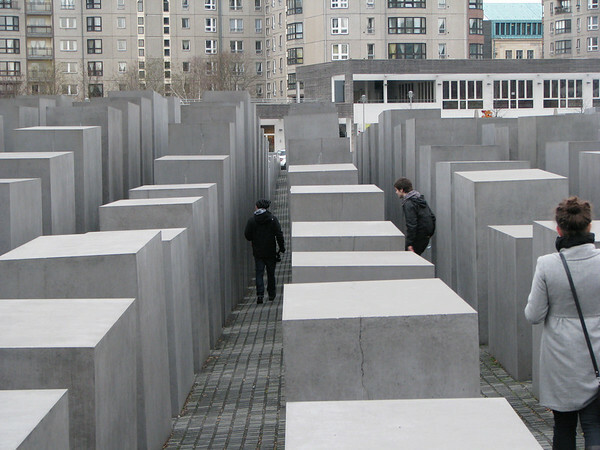 You would find information about it in any of the hostels in Berlin or you could just show up at 11 o’clock or 1 o’clock at the Starbucks right at the Potsdamer Platz which I have heard described as the Berlin version of Times Square which is really overkill. It is a modern shopping area and there is some signage out that which is where that comes from and there’s a movie theater. But we’re talking about much smaller scale than Times Square. But nonetheless interesting, there is a lot of new construction in East Berlin. When I was there 20 years ago the center of the city in terms of activity was the Western sector and now that really has moved to East to Alexanderplatz and Potsdamer Platz and places like that. The next day we went to the Kaiser Wilhelm Memorial Church, just off the Kurfürstendamm, it used to be West Berlin. And I don’t know if you’ve seen pictures of this but this is a church where it was destroyed largely by bombs in World War II and rather than rebuild the church they left it as a monument as a memorial and then they built a new church on either side of it, they built the Clock Tower on one side and church sanctuary on the other and so you can go into portions of the church that weren’t destroyed and there’s a little bit of the history of that church there and that tells you some of what was going on at the time. It was built by Kaiser Wilhelm shortly before World War I and again outside there was a Christmas market and I should point out I have been saying Christmas markets all the time, Christmas markets is largely these booths which are outdoors most of them enclosed only on three sides and then open to the elements in that chilly December weather and they have a variety of things. Half of them are probably foods, you can get your brat there, or you can get your Gluehwein or your hot mulled wine there then and the other half are crafts or other goods that you can buy, certainly a lot of Christmas things. There are shops there like this one that had a lot of Christmas ornaments and Christmas decorations there. I would have liked to have been in Berlin one more day because we didn’t get a chance to go to any of the museums on Museum Island. Specifically I was hoping to get to the Pergamon Museum which has a lot of ancient artifacts because a lot of the first generation of archaeologists came from Germany, so a lot of very historically significant artifacts ended up back in Berlin. But we did get a chance to go out to the East Side Gallery, the East Side Gallery was just recently repainted here for the 20th anniversary but it’s a section of the wall that was preserved and it was turned basically into an outdoor art gallery. Now most of the works in the wall I don’t think did much for me but I did enjoy some of them and my favorite is probably the one of the Trabi, little Trabant breaking through the wall. All of them very political in tone, all of them talking about the wall and its effect and what happened when the wall fell. So very interesting, check that out. We didn’t have a car, we get around this whole time on the public transportation system which works well and I think that’s really going to cover Berlin. So I would like to move on to Prague. We’re going to cover two destinations in one on this show for no additional charge. From Berlin we went to Prague, we took the train down to Prague to get there and we had a great opportunity while we were in there and I want to acknowledge that ourexplorer. com basically gave me a complimentary day tour with the guide from Prague, Sophie Milenovich who has guided for years although this was actually the first tour that she had done through Our Explorer. This will be your internet resource for today, what they do is they basically are a clearinghouse for local guides and so if you had gone to Sophie directly you would have paid the same amount as if you had gone through ourexplorer. com, but they help her find people to take tours with her and then they basically take a 10% cut off the top and she was a very good tour guide, met us at our hotel. 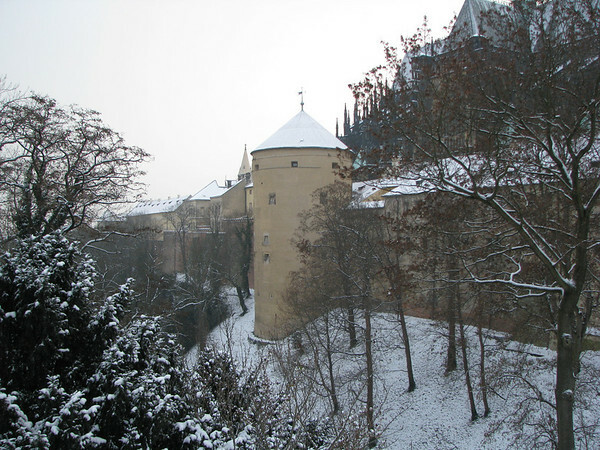 A little bit late because it was fresh falling snow that was snarling traffic in Prague but we hopped on the subway and went over to Prague Castle. To start, Prague Castle is definitely a must-see if you’re in Prague. We just did the exteriors with Sophie and then came back later on and did the interiors and exterior is quite remarkable, especially the cathedral there the St. Vitus, St. Wenceslaus and St. Adalbert Cathedral, that’s the full name of the cathedral there. It’s a cathedral that basically took 600 years to finish and it was finished only in the early 1900s and so the cathedral has a variety of different styles including gothic styles but also renaissance, baroque and then — well I actually enjoyed is that one of the stained-glass windows, the mucha window is actually in the style of Art Nouveau because it wasn’t painted until 1925 and so it’s very strange for me to look up at a stained glass and see the very distinctive style of an art nouveau style, a very interesting characters in that particular stained glass window and for those of you who don’t go to the website regularly, every month I provide a desktop picture for you to dream about travel on your computer and this month’s picture is the mucha window from the cathedral in Prague that you can put on your desktop with the January calendar on there. So check that out. I would encourage people to go to the website regularly for little treats like that. I’m also doing a photo of the day and you will get some these other pictures in there of Berlin from last week and next week I will actually be starting doing pictures of Prague. So again that cathedral is within the Prague Castle, the St. George Church is also within the Prague Castle. The Prague Castle is very large, one of the largest castles in the world according to Guinness Book of World Records. I would say we enjoyed the exterior tour work with Sophie more than we enjoyed probably the interior tour. The interior tour, we did the audio tour of the cathedral and it was a little too much detail. I really don’t need to know quite that much. Skip to some of the high points perhaps would be more appropriate. The castle was actually not inhabited for number of years after the Hussite Wars, and if you’re not familiar with the Hussite Wars, about a 100 years before Martin Luther started what we call the Protestant Reformation John Hus or Jan Huss depending on your pronunciation and Prague also was a reformer who was later burned at the stake and the Hussite Wars were basically Prague Wrestling at that time with the reformation and specifically a lot of the peasants revolting against the landed class. And one of the reasons they were able to do that is that was around the time of the introduction of gunpowder in Europe. So again checkout the Prague Castle. Lovely view of the city, of Prague from the Prague Castle. We went from the Prague Castle then down over the bridge into the Jewish ghetto and there is a tour that you can do, we didn’t do that with Sophie. We can back into that later on, a number of the synagogues in the Jewish ghetto. Most of those synagogues have been turned into museums and one of them into a memorial. The one Jewish synagogue right there by the famous Prague Cemetery which we had mentioned earlier in this episode is just filled with the names of the Jews from Prague written on the walls who were killed by the Nazis in World War II and it is obviously a very sobering memorial just to look especially for someone like me who has a lot of friends who are Jewish. I went to school in upstate New York. I work for someone whose last name is Friedman and just the number of names on the walls that are the same as the names of people that I know who are friends of mine was very sobering and very somber. And then we had some confusion in terms of how long we were going to be with Sophie. So we actually did some exploring on our own and found a big old place and explored some of the town around the base of the Prague Castle. Prague is a beautiful city, I just really enjoyed. We enjoyed the Charles Bridge obviously which is very well known with the statues along the side and the two very unique towers at both ends. They were doing some construction which isn’t good for photographers like me but just still very beautiful even in the cold of winter it was very cold in Prague. The high was in the teens and many days but because Prague escaped a lot of the damage from World War II because of its location it has a lot of these just beautiful façades especially just the architecture was really something. The area below the castle is known as the Malá Strana or Lesser Town in Czech and I would have to say we picked up almost no Czech. Czech is not a language that’s familiar to me and part of the problem is you can get by so easily in English in Prague, they get so much tourism that it really isn’t an issue but unfortunately at that point there’s also not a lot of motivation and also in the Malá Strana there is the largest church in Prague which is again named after St. Nicholas and it’s a very baroque church just over-the-top baroque if you are into the very ornate style of that. You know you got to enjoy — for me the statues of bishops with their staffs standing on the wicked, probably protestants in this case, and then of course in the Central Square in Prague there was a Christmas market again that’s a real theme here. 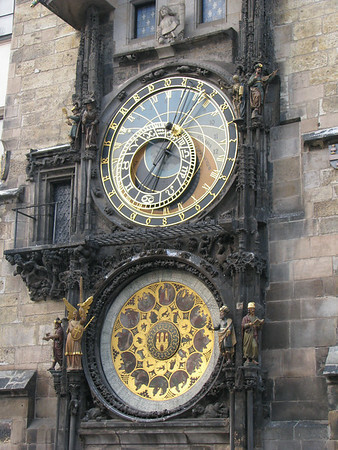 There is also near there the tower with the famous Prague Astronomical Clock and this clock can tell you the phase of the moon. I think it can even tell you possibly your shoe size. I mean it’s just this amazing complicated clock that can tell you so many different things and the story goes that the person who created this clock was then blinded so they wouldn’t create one for another city and have competition for how wonderful this clock is. There is also a statue of John Huss in that particular square and then I’m told although we couldn’t see because of the Christmas market, there also markers to various Prague Noblemen who were executed in the square when the Austro-Hungarians came in and took over Prague which was part of the Austro-Hungarian empire or part of when the Habsburgs took over Prague. So couple of things we enjoyed seeing in Prague, I mentioned the synagogues, the most beautiful of the synagogues which is now a museum is the Spanish Synagogue and that is decorated in the Moorish style of architecture. Unfortunately you can’t take pictures in any of the synagogues, you can take pictures in the Jewish cemetery but not inside any of the other ones not in the memorial for sure but also not in the museums. We also enjoyed the Museum of Communism which is near Wenceslas Square and this was the theme I think of this particular trip here between The Berlin Wall and here and very interesting picture into life under communism in Prague in what is now the Czech Republic in Czechoslovakia. They would have something that would tell you about sports and then they would have a lot of different paraphernalia and posters and pictures and such about sports. They would have something, it would tell you about production or the shelves and how better they were and how you could get things under the counter but you couldn’t get them on the store shelves and just a number of different things. The surprising things there are how much was blamed on the west of the problems, so when there is a poor potato harvest clearly that was because the west had sent in potato bugs to sabotage the harvest and just a number of misinformation and probably the highlight of that particular museum is a longer video which is about the Velvet Revolution. So Prague had two different time periods where it tried to come out from under communism or at least out from under the harsh Stalinist kind of communism and the first one was the Prague Spring where they enacted a number of reforms and eventually the Soviets rolled in tanks and then the second one which was successful just before the fall of the berlin wall was this Velvet Revolution where there were a number of protests that were trying to oust the leadership of the country. 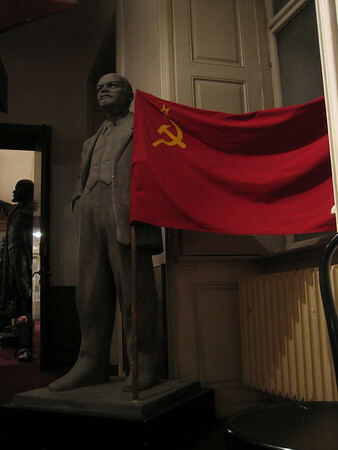 They oust the communist leadership because of mostly because of issues around economics and how poor things were there. And this video went through seeing some of those protests as people were trying to have a nonviolent protest and the police were coming in and roughing people up and such and as the crowds got bigger and bigger eventually that led to the downfall of the communist regime there and in part obviously because this is the time of Gorbachev and Glasnost and Gorbachev had already announced that each of the countries could go their own way and could make up their own decisions in terms of what they wanted to do with communism and that really opened the door to reform and both that museum as well as the museum at Checkpoint Charlie also gave a lot of credit to the Polish Labor Unions which was really kind of the first crack in the Soviet Bloc and then talked about how that played into other things. So very interesting especially in light of the 20th anniversary of the fall of The Berlin Wall. We did also get to see some of the other sites like The Powder Tower which is again an older tower in town that was at one time used to hold gunpowder which is where it gets its name from and then also see the municipal house. We had tea or coffee in the municipal house which has a café and it’s a lovely art nouveau building with a French style café which is to say the waiters were rude and unresponsive. They had really gotten that down very well. If we had another day in Prague I would have loved to take in one of the many concerts that were going on but we weren’t able to fit that into our schedule on this particular trip. I would love to go back to Prague sometime in the spring and have a chance to sit in a beer garden, overlooking the city and enjoy just the beauty that is Prague. Prague really is a beautiful city. I would say it’s the most beautiful city I have been to in Europe so far, with a possible exception of Venice which is also obviously very unique. 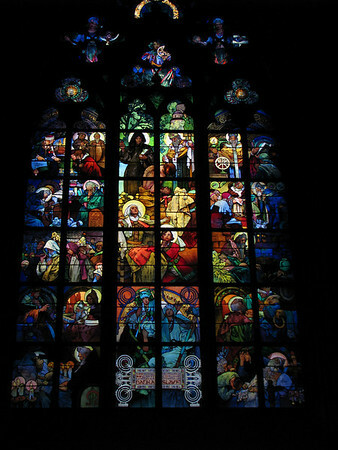 Two final sites for you that we enjoyed, one is very traditional and that is in the Prague Castle. There is The Golden Lane, that’s part of the tour package to tour the interior of the Prague Castle and that was probably our favorite part. These little tiny houses that are alongside the wall where the soldiers after the Great Fire that leveled a lot of Prague, asked for permission to build their houses inside the wall here and they are turned into little shops. There is also a little tiny exhibit about torture there which my wife and daughter did not go to and then an exhibit about arms and armor upstairs in a long narrow corridor, they are next to the wall. 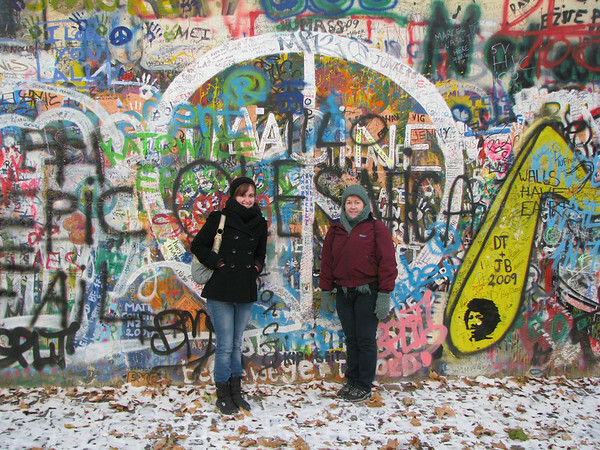 And then we also went to the John Lennon Peace Wall and this is a wall that is decorated with graffiti but was also decorated with graffiti about peace during the Communist Era and the Communist couldn’t restrain this activity and so it was a formal protest against communism. And that’s what I want to cover on this particular show. This is the second show mentioning both Berlin and Prague, so check out in the archives on the Amateur Traveler’s site for shows that cover them in a little more depth but I did want to share some of my experiences also for those of you who are watching the enhanced version, share some of the pictures that I took while I was there and this is really more of a Prague and Berlin in December and really the Christmas markets really is probably the most defining feature of going at this time of year. 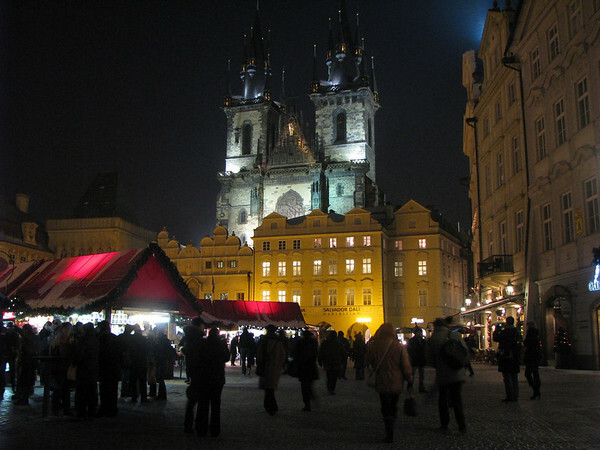 And I didn’t mention but while we were in Central Square in Prague at night there were concert singing and children’s choirs and a number of things going on there in the Christmas market there by City Hall. Even though again when we were there the high was minus 14 Celsius and this was probably lower than that by at least 10 degree Celsius by the time we got to night fall and it was pretty darn chilly but everyone was enjoying then out there. There is also another segment of Prague life at this point which is much more modern and contemporary, there are malls just right by for instance the art nouveau café that I mentioned earlier, there are modern contemporary malls and we had dinner there and had Mongolian Barbeque. So really both Berlin and Prague now are both modern cities as well as having this very rich history. As I mentioned I was going to talk about the Amateur Traveler Tour of Vietnam which is still scheduled for March. There are details now about the itinerary for that trip on the website at amateurtraveler.com, so check that out and I need three people to go to schedule that trip. We did have a good although small meet up in New York City. I will tell you a little more about it, actually in a couple weeks because Joseph, who I met at that meet up I have invited him to come on the show. So I will probably tell you more about it in the episode that I get him to come on to talk about some of his travels from Africa but there is a good story there that I’ll tell you when he comes on. One thing though when I was talking to Tricia at that meet up that wasn’t cleared, a lot of people don’t go to the website and so you don’t know what resources are available on the Amateur Traveler website amateurtraveler.com. I would encourage you to go there and check out. I mentioned some of the resources like the monthly travel wallpaper this time and obviously I want you to go check out what’s going on with that tour even if you don’t think you want to go this time. I would be interested in your feedback whether this is the kind of thing you’re interested in or how you would want it to be different because I do want to plan more tours. The other thing that I found a Tricia didn’t know and I suspect very few of you know is that if you’re planning for instance as they are a trip about Asia you can go to asia.amateurtraveler.com and just see the episodes about Asia. Similarly if you’re planning of going to Europe you can go to europe.amateurtraveler.com and just see the shows about Europe. So you might want to check that out. Remember that there is the Amateur Traveler iPhone application for those of you who have an iPhone, I just had a meeting today with Jen Leo, who is a lead traveler blogger for the LA Times and she is one of the people that I do this we can travel with and she still finds that that application is much more useful for her than trying to figure out the whole thing with how to get things on her iPhone using iTunes and how to listen to podcasts in general. So if you are someone who has just checked out this show once or you’ve heard about it you might check out the iPhone app and also since I did just do the meet up and I’m trying to get the word out about the tour I would encourage you to sign up for the e-mail newsletter. I don’t send out e-mails that often probably no more than once a week and right now I’m really on an every other week kind of schedule although I’m trying to get to once a week but I try to put useful things in there especially useful announcements. So if you want to keep current and find out some of these things the you might otherwise miss please join the mailing list and if you go to the website and click on the e-mail icon on the upper right-hand corner you can simply sign up for the e-mail list and I won’t sell that e-mail list to anyone. And with that we’re going to draw this episode to a close. If you have any questions feel free to leave a comment on this episode at amateurtraveler.com or send me an e-mail at host [at] amateurtraveler.com. Check out the Facebook community as well and as always thanks so much for listening.